You are here:Home-Domain.com-What is a Website Builder? If your small business or brand is coming together, the next crucial and somewhat scary step ahead of you is to create a website. But what do you if you can’t afford to hire a developer and have no knowledge of coding? Fortunately for you, there is the website builder: a tool that allows anyone and everyone to build and create beautiful website design for a personal or e-commerce website. Want to learn more? What characteristics are found in a good website builder? A website builder is as it sounds; an apparatus that allows you to craft your very own site. This platform or software is typically engineered to have a user-friendly interface, with plenty of drag and drop functionality and preset styles and website templates to choose from. They allow you to build a website from scratch by using prebuilt structures. In this way, with a bit of invested time and some pointed tutorials, you can start creating your layout, style, and then integrating your brand’s elements and content. The code runs on the backend, but the frontend is a platform of digestible, easy-to-learn features which allow you to build your home on the internet landscape. An online website builder is a platform that you access through your web browser. Instead of downloading the builder’s software, it’s hosted on the cloud, which you can access anywhere there’s internet. An offline website builder requires the user to download software and host the files locally on their computer. It’s a general rule of thumb that offline website builders take a bit more technical knowhow and experience, seeing as the files will have to be uploaded onto a web hosting platform once the buildout is finished. Why Do People Use Website Builders? To put it in perspective, many renowned web developers use website builders, like WordPress, to put together websites. These tools are not reserved simply for novice users within the web development space. Of course, if the website is going to need extensive coding with complex functionality and advanced security, then a standard website builder might not be the recommended option. In many circumstances, a small business needs scant more than a functional, good-looking website that is easy to navigate. Any web developer will tell you that a website builder can do this in the blink of an eye. They’re right. A website builder can create a good-looking, viable and functional site in a matter of hours. Being that the website builder is pre-coded, there’s less room for error. The pieces you build, layer, and add together will work because they were designed to complement one another. You’re not creating new “pieces of a website” hoping they integrate perfectly, you’re integrating pieces that have been tested countless times before. You don’t need to be a graphic design guru, web dev pro, or even understand HTML to use a website builder. One facet of website builders is their template catalogue. These templates come integrated with color theory, crisp designs, and functional processes. They do the work so that you don’t have to. It should be no surprise that it’s far cheaper to utilize a savvy website builder instead of hiring a web developer to do the work on your behalf. Truth be told, most of the web developers you hire will be using some sort of templatized platform—especially if your website does not require custom coding. Hint: most don’t. Since website templates are pre-coded in website builders, there’s little need for upkeep and maintenance. Of course, the website should be continuously updated with fresh content for your audience to engage with, but this is another “plug-n-play” process of a good website builder. Many small business owners or brand creators want to go the DIY method when it comes to their website. They want to learn how the process works and maintain full creative control, and that’s understandable. For many online website builders, companies like Domain.com offer technical support along with the builder. This means if you run into any issues, you can call them for free. Now that you have a general understanding of why people utilize website builders, when you start your hunt, what features and characteristics should you be looking for? What Makes for A Good Website Builder? What makes for a good website builder is often subjective due to the needs and experience of the user. What one web developer may qualify as “good” can differ from the opinion of another. Yet, there are some ubiquitous characteristics shared by website builders which most everyone agrees are measurements of their quality. Complements beginners and pros – The novice can learn how to navigate the platform quickly, and the pro can utilize its wide offering of features and functionalities. Allows the user to drag and drop nearly every element – This includes text, video, pictures, your logo, and more. Removes the necessity of plugins – You won’t need to download or install any 3rd party software. This further eases the process seeing as the entire platform is hosted by Domain.com. A fully customizable design stack – This includes fonts, colors, layering, and graphic design. A fully customizable template catalogue – You don’t want to have static, stale templates — ones that seem to have been developed without the help of a professional graphic designer. This can indeed create a cheap looking website. Instead, you want a large selection of templates to choose from. Each one should be customizable (to an extent). Customizable images – You’re going to want to utilize a website builder that comes with an image editor. It should be obvious that the images on your website need to be purposefully selected, immersive, and engaging to the eye. Having a one-stop-shop image editor is the perfect way to simplify the process. Mobile responsive customization – It’s more likely that your audience will view your website via their smartphone than their computer, meaning it’s imperative to format a website for mobile. It is critical that the website builder you choose caters to mobile formats. One of the most important facets of a company’s growth is keeping track of their performance on the web. Today, with analytical tools, users can track every interaction a potential customer has with their website. Analytic Tools – The most common you’ll see is Google Analytics, being that Google is the search engine every company wants to rank on. SEO Tools – A basic keyword generator and the integration of metadata with the possibility for further expansion. A shopping cart – You’ll want your website to support the shopping cart feature, as that’s the easiest way to purchase a given product. Inventory management – You’ll want your backend to have a one-stop-shop to track your inventory and stock. Payments – From Stripe, PayPal, to credit cards, you’re going to want your website to support online payments. While the ecommerce features mentioned above are standard, the integration of them is not. The key is to find a website builder that seamlessly integrates each feature, seeing as they will be the pillars of your ecommerce platform. Before building your professional website, there are a few steps that must first be completed. For instance, for your website to exist on the internet you’re going to need a domain name, which will also be the name of your website. And before you purchase this domain, you’re going to need to choose a hosting platform and website builder. Once you’ve obtained your domain, you’re going to have to choose a hosting plan based on your specific needs. Once you’ve settled on a domain name and chosen your host provider, now it’s time to utilize the website builder and start creating the website itself. Explore the large library of templates and then customize them. Try to evaluate exactly how you want to position your brand and what you’re trying to showcase, then find the perfect base template that complements your vision. Once you’ve laid a solid foundation for your website, it’s time to customize. Create a standout website by integrating stellar images that are brand-specific and original. Steer clear of anything “stock” or “filler-focused” and try to, if you can, place original content anywhere possible. This will further showcase your brand and add to the uniqueness of your platform. Once your website is finished, adding an analytics tool is a fantastic way to measure its success on the internet. The data generated by these tools will allow you to understand how well you’ve positioned your brand, where to make changes, and where you’re succeeding. In today’s digital climate, it’s nearly impossible to compete with other brands without some sort of analytics tool. A website builder is a tool that allows both novices and pros alike to create a professionally designed website. With pre-coded templates, user-friendliness, image editors, analytical tools, SEO tools, and more, it’s never been easier for someone with zero technical knowhow to build their own block of real estate on the internet. At Domain.com you can buy your domain, set up your web hosting service, and utilize their powerful website builder all in the same place. Better yet, they’re available to answer any questions you may have and guide your through the building process. Reach out today to get started on building your online presence! WebSavvy Marketing. 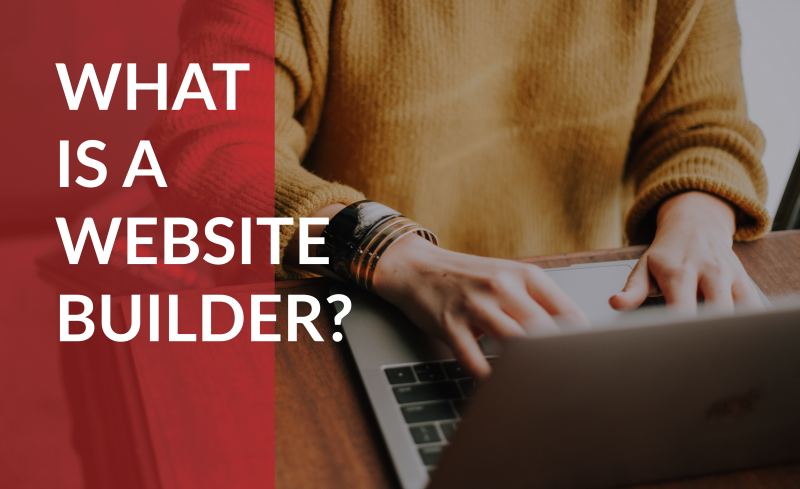 What is a Website Builder? June, 2017. Website Builder Expert. Website Builders. Website Builders Debunked | What Are They And Who Uses Them?